I really liked the idea of a 100% natural cream but with a colour so unusual and strong! To accompany a color so marked I opted for a spice flavor equally determined, that is ginger. Chop the scallions and finely slice the cabbage. Saute the shallot in the oil and add the ginger. Stir briefly and then add the purple cabbage. Cover with cooking water, about 800-1000 ml, depending on the final texture that would attract. Add salt to taste and simmer for half an hour, until the cabbage will not be well cooked. After the first 15 minutes of boiling, add chickpea flakes, which give texture and flavor to the supple. 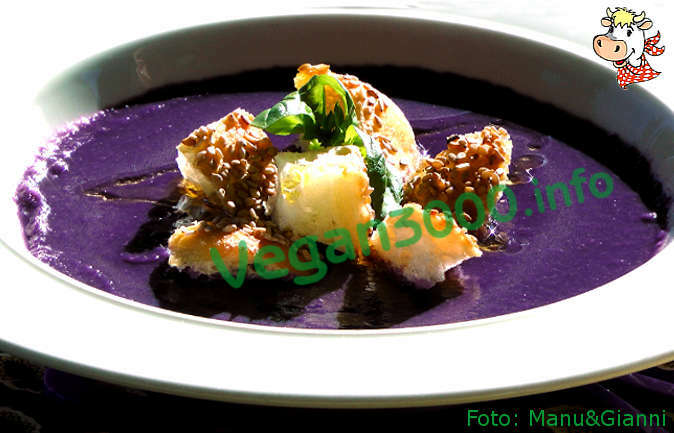 Once cooked blend everything thoroughly and serve this unusual purple velvet bringing to the table a different color.